First, evaluating university honors programs is far from an exact science. While this is also true of all college “rankings,” it is even truer of honors colleges and programs. Our own project began with modest aims, and it is ending with modest claims. The distinctions among the programs evaluated for the Review are small (see below), especially among the leading programs. Often, these distinctions come down to which program has better housing, or recognized study-abroad options, or priority registration for honors students. Some parents and prospective students may consider some or all of these features as unimportant when compared to rankings of academic departments, prestigious scholarships, or, say, the annual U.S. News rankings. What we have attempted to do is come at the evaluation process from more than one perspective in order to reflect the subtleties of honors colleges and programs. The two major categories in our evaluation are Overall Excellence and Honors Factors. Additional categories are determined by program admission requirements, mainly SAT/ACT/GPA criteria. We have four of these sub-categories: SAT 1400+, SAT 1300-1400, SAT 1220+, and, to reflect yet another difference among programs, a fourth category including universities with an engineering/agriculture focus. The availability of priority registration for honors students=2.5%. In addition, programs or colleges with high enrollments of honors students may receive up to 1.5 “bonus points” for strong performance in curriculum, prestigious scholarships, or honors retention/graduation. 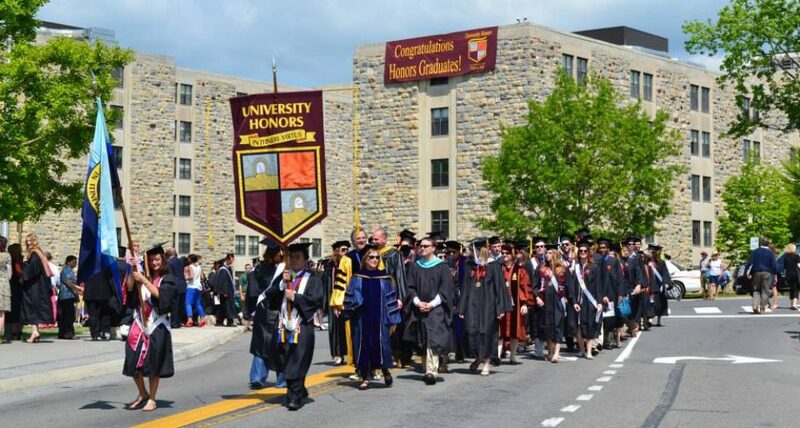 The bonus points are in recognition of the economic and organizational challenges inherent in providing honors education to larger groups of students. Why did we choose the criteria and percentages that we did? First, the classroom is where the most frequent contacts between students and professors take place. An extensive curriculum promotes the most classroom contact. Another reason for the emphasis on curriculum is that the National Collegiate Honors Council (NCHC) gives it such a high priority. Still another reason is that our research finally led us to conclude that a program’s inability to articulate a strong curriculum was often indicative of other issues. Prestigious scholarships are often touted by honors programs, and we believe that they should be. If honors programs at public universities want to compete with the private elites, then prestigious scholarships are part of the contest. Do we believe that they should have an overwhelming influence? No, but, as the highest honors a student can achieve, they are important. The scholarships that we include are Rhodes (full history); Gates/Cambridge (2001-2011); Marshall (2001-2011); Churchill (1963-2011); Truman (1977-2011); Fulbright (1993-2009), adjusted for size of undergraduate population; Udall (1996-2011); and Goldwater (1989-2011). Graduation rates are important, especially as a point of comparison with university-wide rates. We believe parents and students should have as many ways as possible to assess honors programs, and one important way is to see how the programs improve on the performance of the university as a whole. As noted elsewhere, we used estimates for some programs, based on actual data for all graduates at each university and actual data for honors graduates only, at many institutions. From these data, we were able to estimate with enough confidence that we went forward with the metric, but we limited the range of possible scores. Housing comes across as an extremely important factor for students and parents alike. We did not want to give it a dominant place in our review, but we believed that it had to be assessed. There are many ways to look at honors housing; we finally decided to score the housing using location and room configuration as the main, but not only, criteria. Study-abroad, as discussed elsewhere, is increasingly important. Our metric in that category is a mix of university-wide and honors-specific data, and it is not as strong as we would like. That is why we caution that differences in the scores should not be taken as determinative, at least for programs scoring 3.5 or even 4.5. Having said this, we decided to go with what we had so that, in most cases, readers could get an idea of the study-abroad programs. Programs were assigned scores in .5 increments based on the percentage of honors students participating in study-abroad activities; the percentage of university students participating; the duration and type of study-abroad experience; and the total number of university students in study-abroad programs. Programs that received special mention in U.S. News were also eligible for extra points. This approach has been useful in identifying universities with nationally recognized study-abroad programs, but those universities that do not quite rise to that level of recognition might not receive as much credit in our review as they deserve. Therefore, a low score for a given university in the study-abroad category should not be determinative, but a high score is a robust indicator. Priority registration is a tough one: honors students love it, but many honors administrators are wary that it confers too much favoritism and creates enmity within the university as a whole. Some administrators also believe that many students may enroll in honors only or primarily because of priority registration. We wanted it to be in the reviews because it is so important to many students. We also agree that it is important, not least because it can help students graduate on time. In this first edition, we decided not to give it enough weight to make it a deal-breaker. In the next edition, we might increase the weight. As for the percentages assigned to each category, in the end, as is the case of others who do comparisons or rankings, the choice of what to emphasize is part subjective and part a result of the available data. We did not finally determine the weights for the categories until we had completed our work. This is the best way to “let the data speak.” On the subjective side, the cumulative impressions formed over many months of continual research helped to guide us toward the curriculum emphasis. On the data side, our stats about the prestigious scholarships are very accurate, given the awards we were able to analyze. That is but one of the reasons we used that metric for Overall Excellence. And that’s the short answer to the question we posed above! The criteria for Honors Factors only are the same as those for Overall Excellence, except that the metric for prestigious scholarships is not included. The reasons: some relatively new programs have only recently begun to emphasize these scholarships, and others find themselves at a disadvantage because they may be surrounded by elite private institutions that receive disproportionate attention when it comes to major awards. The maximum total score for Honors Factors is 75, although programs may earn .5 or 1.0 bonus points for strong performance in curriculum and honors retention/graduation. It is important to know that the scores separating programs listed in both the Overall Excellence and Honors Factors lists may differ by as little as .01. We maintain such small differences so that we are better able to use multiple comparisons with more accuracy. For example, when we show how the Perception of a university as a whole differs from its Overall Excellence, and how that, in turn, may differ from its Honors Factors, we are dealing with rankings within rankings and need to employ what seem to be minor distinctions. While we believe these minor distinctions are useful in our approach of employing multiple comparisons, we also want readers who are looking at the two main lists of Overall Excellence and Honors Factors not to get lost in the finer points. A difference of 2 or even 3 whole points is certainly not enough to override other factors of greater importance, such as strength in the major field, financial assistance, location, personal visits, or even national rankings of the universities as a whole. A striking example of our advice to look holistically at these major lists can be seen in the list for Overall Excellence, where the total point difference between the university ranked 7th and the university ranked 13th is a mere 1.12 points. Another way of understanding this important caveat is to see what the difference between a typical, single numerical ranking, such as that utilized by U.S. News and others, would look like compared to our list. Using the same universities in the example above, our ranking is 7, 8, 9, 10, 11, 12, and 13–or seven distinct places. If we had used a single numerical ranking that rounded scores to whole points, the same schools would rank 7, 8, 8, 8, 8, 8, and 13. Let us be candid about the data: they are not definitive, but we believe that they are strongly suggestive. We say this up front because many programs chose not to cooperate with our project. One reason is that many honors professionals doubt that their distinctive programs can be compared in a meaningful way; but another reason is that a lot of honors programs do not have the information on hand that they probably should have in order to assess their own value to students. As we–and they–work our way through this first attempt to evaluate honors programs, perhaps the process will yield much better information in the future. We have devoted most of our time during the six-month research effort to sorting out honors curricula, using as a resource what most parents and students would have to use: program websites, catalogs, annual reports, etc. In some cases, we have clarified program requirements with honors staff. Before final publication, all programs and colleges under review received advance profiles along with an invitation to respond. Many did so, but some did not. Finally, we also have summaries that show the Overall Excellence rank and the Honors Factors rank for each program, according to the admission requirements of the group (SAT/ACT/GPA).